When you open a Scene or any External events, the Scene Events editor is presented on the tab above the opening window. The Events Editor is where you add the events that create the actual gameplay. It allows the game players to play and interact with your game. The Events editor is a tool that gives you the power to visually program your game. You do not need to have any programming or coding experience. Anyone can make a game in GDevelop! To switch between the Scene editor and the Event editor you use the tabs at the top of the window. 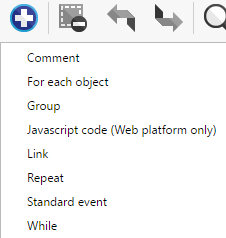 You can add any number of event blocks to the Event editor. Each event can have various conditions and actions. Once you add an event, you can use the conditions and actions to create the game's logic. Learn more about events, on this page: Events. By clicking the add sub-event button, you can add a “child event” block to the selected event. After clicking the button, a blank sub event appears below our selected event. Sub events are executed only if the parent event's condition(s) are true. Sub events provide a way to avoid repeating the same conditions. They make the logic much easier to read. By clicking the add comment button, you can add comments to events. Comments help us to remember what the events do. Comments are an important part of any game or application. They help you to organize and remember exactly what the event and action logic is accomplishing. By clicking the add an event button, along with the ones we already mentioned, we have access to some special events. Read the help about events to learn more. The “search in events” button opens a panel on the bottom on the screen. There, you can search for a specific term in the parameters of the conditions and actions. You can also enter a replacement parameter and replace all the occurrences of the text in the events.